You will receive a total of 1 coffee table and 2 end tables. 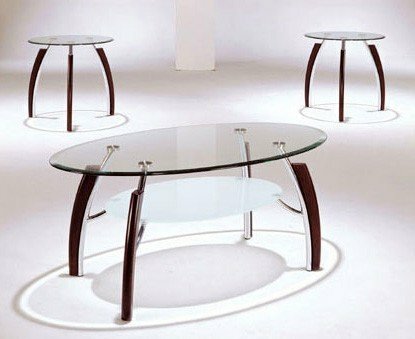 Item features beveled glass top and chrome finish legs. The set is simple yet elegant in its contemporary and modern living room style of furniture. 3pc Coffee Table & End Table Set Chrome Cherry Finish Living Room Living Room->Coffee and Occasional Tables->Coffee and End Table Sets Some assembly may be required. Please see product details.